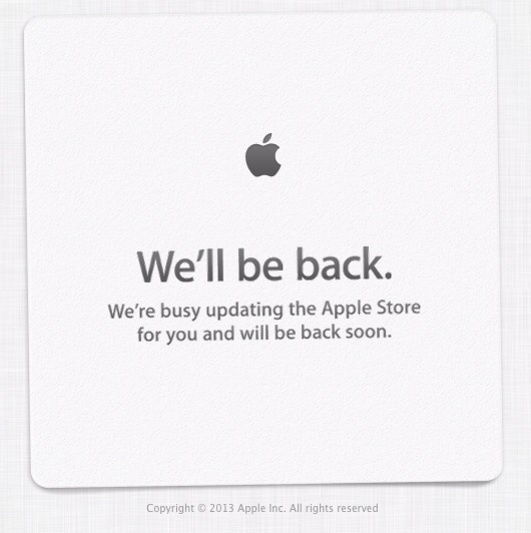 thef1rmwareumbrella: Apple Store Goes Offline Hinting Retina iPad Mini Launch? Apple Store Goes Offline Hinting Retina iPad Mini Launch? Earlier today, it was reported that the Retina iPad Mini would be launched tomorrow, November 12, according to leaked post from its GSX site. We were skeptical of this date, considering Apple has never held a 'quiet' launch for an iPad, however due to supply constrains it would make sense for Apple to hold a 'softer' launch to reduce large crowds/demand. Right at midnight (EST), the Apple store also went down, which usually happens for new product launches. However, server maintenance and upgrades also cause the Apple Online Store to be taken down, so it is possible that the downtime is simply for server maintenance. If Apple does begin taking orders for the device tomorrow, it will likely go on sale around 3:00am EST. Please download the new Limerain App and follow Limerain on the go. Also follow Limerain on Twitter, Facebook, or RSS to be notified of any updates.